In a signal to revitalize an ailing reset in its relations with Moscow, Washington narrows down the list of personae non gratae to 18 low-ranking officials. U.S. President Barack Obama’s administration has released the names of 18 Russians on the so-called Magnitsky List who will be denied entry to the United States and have their U.S. assets frozen in what is being seen as a clear de-escalation of tensions between Washington and Moscow. Russia has promised a “reciprocal” response within 24 hours, but the scaling down of the rival lists, previously thought likely to provoke a new round of bitter recriminiations, may finally signal a thaw in bilateral relations. The U.S. list came out in a follow-up to the Sergei Magnitsky Rule of Law Accountability Act, signed by U.S. President Barack Obama in December 2012. The case of Sergei Magnitsky, a 37-year-old Russian lawyer for the Hermitage Capital investment fund, who died in pre-trial detention in 2009 after allegedly being ill-treated in Moscow prisons, tarnished U.S.-Russian relations greatly, with Russia this January retaliating with a ban on adoptions of Russian orphans by Americans and a ban on NGOs working in Russia to employ American nationals. All but two people on the Magnitsky list are suspected by the American government to have had a role in the death of Magnitsky. Russian officials have consistently denied any wrongdoing in the Magnitsky case, however, insisting that Magnitsky died of a heart attack. The other people on the U.S. list – Lecha Bogatyrev and Kazbek Dukuzov – are suspected of having a role in the murders of Chechen leader Ramzan Kadyrov’s critic Umar Israilov in 2009, and the editor of Forbes Russia Paul Khlebnikov in 2004, respectively. Magnitsky was arrested on fraud charges in November 2008 shortly after he released evidence claiming that a group of Russian law enforcement officers and tax officials had embezzled $230 million from the Russian budget through a tax rebate scheme. He was prosecuted by the investigators he had accused of corruption, including Lieutenant Colonel Artem Kuznetsov and Major Pavel Karpov, who were both named on the U.S. blacklist published Friday. 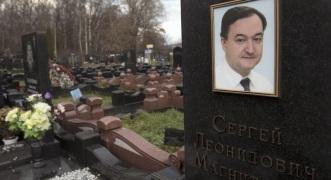 While an independent probe by the Russian Presidential Council on Human Rights found that there were grounds to believe that Magnitsky’s death was caused by beating, no one has so far been called to justice. The only official yet put on trial over Magnitsky’s death, former deputy head of the pretrial detention center Dmitry Kratov, was acquitted in December 2012. His name is missing from the Magnitsky list released Friday. “The list is not politicized, as many believed it would be,” Nikolay Zlobin, the President of the Center on Global Interests, based in Washington D.C., told RIA Novosti news agency Friday. The sponsors of the Magnitsky Act, Senator Benjamin Cardin (D-Md.) and Representative James McGovern (D-Mass. ), had sought to have 280 names on the list, including the head of Russia’s Investigative Committee, Alexander Bastrykin, and the head of Moscow City Court, Olga Yegorova. The White House, Zlobin said, had “blacklisted only those directly implicated in violating a particular law,” which in his view shows that Obama wants relations with Russia to be less politicized and more focused on concrete actions. On Monday, Obama’s National Security Adviser Thomas Donilon, is scheduled to meet with Russia’s Security Council chief, Nikolai Patrushev, and with presidential aide Sergei Ushakov in Moscow to compare notes ahead of upcoming top-level talks. President Vladimir Putin is expected to have a one-on-one with Obama during the 39th G8 summit, which is take place in Northern Ireland on June 17 and 18. While in Moscow, Donilon will hand over Obama’s letter to Putin, Russian Foreign Minister Sergei Lavrov told RIA Novosti in Switzerland Friday. “The release of whatever lists will undoubtedly have a very negative effect on Russian-American bilateral relations,” Putin’s spokesman Dmitry Peskov was quoted by RIA Novosti as saying Friday. “At the same time these bilateral relations are multifaceted, and even burdened and affected by such negative manifestations, they still have good prospects for further development and growth – there will always be a great deal of issues to discuss,” he added. Dialogue between Moscow and Washington has been strained by the Pentagon’s plan to deploy a missile shield to Eastern Europe to potentially intercept Iranian missiles. Moscow argues the shield might target its missiles. U.S. Secretary of Defense Chuck Hagel said last month “the timeline for deploying this program had been delayed to at least 2022 due to cuts in congressional funding.” The news should mitigate the effect of the Magnitsky case on bilateral relations, experts say.